Birthright Israel is an amazing program that brings, according to their website, brings more than 48,000 young Jewish adults to Israel to share in an unforgettable and often life-changing 10 day trip. Then there is the Jerusalem Academy of Music and Dance. which has over 1,600 young people walk through their doors every day to “learn, create and express their commitment to music and dance. Jerusalem Academy decided to surprise them at the airport with a very special welcome. Before the Birthright participants even walk through the doors, the fun begins. Soon, members of the Jerusalem Academy begin dancing and singing. They are quickly joined by others from their school descending down the escalators. Bring in a band, more singers, and a huge room filled with people standing and dancing to the music, and magic happens. Watch the faces of those coming in as they too feel the excitement. There is such joy in this video from the performers, from the spectators, from the visitors. Welcome to Israel! 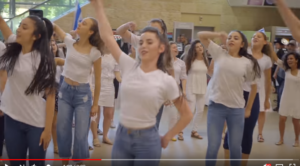 The song is “Hevenu Shalom Alechem” – we bring peace to you. Amazing!